The updated Sixth Edition of The Business Judgment Rule: Fiduciary Duties of Corporate Directors explores developments in the law in Delaware and all other jurisdictions that have addressed business judgment rule and related corporate governance issues, as well as recent cases exploring the breadth and limits of the business judgment rule. 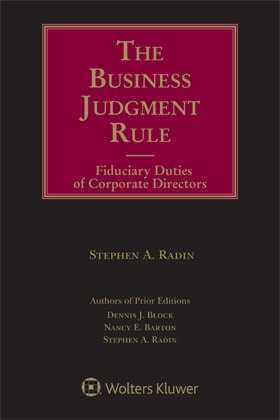 Meticulously researched and expertly analyzed by Stephen A. Radin, partner at Weil, Gotshal & Manges, LLP, and one of the most respected and experienced practitioners in the field, The Business Judgment Rule: Fiduciary Duties of Corporate Directors provides the timely authoritative guidance you need. The author seamlessly combines cases, statutory provisions and commentary to help you make sense of the constantly changing body of law, even as the courts struggle to adapt the rule in new contexts. The Business Judgment Rule: Fiduciary Duties of Corporate Directors, Sixth Edition is a powerful legal tool. It’s the most complete, most current, most practical guide in the corporate governance arena available to working professionals today. 1. Should the Rule Apply to Defensive Measures at All?